I would still like to use orange in the new nursery, but I love orange paired with chartreuse/green, and I had wanted to use those colors together all along. I was just waiting to find the right fabrics to really finalize the design, and I think I’ve finally found them. Hooray! 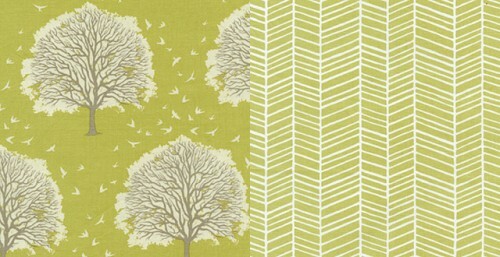 The tree print (Modern Meadow Grass Majestic Oak JD38) will be for curtains, and the herringbone (Modern Meadow Grass Grass Herringbone JD36) is for a crib skirt. Both fabrics are from Joel Dewberry’s latest line for Freespirit. If you google the full fabric names you should be able to find it in stock somewhere. I ordered mine here. I actually just got both of these fabrics myself a couple weeks ago. They are super cute! They will look awesome in the nursery. Oh, good! I just ordered them, so I haven’t seen them in person yet. Great choices! I especially love the herringbone! Perfect! I can’t wait to see what you’ll do to the nursery! You’re family is just the cutest! That fabric is ADORABLE! I love picking out coordinating fabrics. Yes, I thought so too! I actually have a small amount of that fabric from when I was considering using it in the dining room. I was just gonna say that… I love that Laurie Smith fabric. Wish it was still around!! At least I have a bag made out of it. Can’t wait to see the nursery… I LOVE orange for a baby, and I know it is gonna look great! These are great! Thanks for the links! I’m just putting together our mud room and this is the EXACT colorway I was planning! There are plenty of other fabrics in the same colors from that collection too. Cute! I like this with the orange accents…it looks like it will be a really fun nursery! I have been a blog reader for a while but never posted. I am due with a boy in December and we have a 5 year old daughter. They will be sharing a bedroom and I have designed the room using Joel Dewberry’s Modern Meadow Cool Stream fabrics. They are beautiful! Can’t want to see his nursery! love this! when i have babies i am definitely using fun fabrics like these, instead of the usual nursery pastels. cute! Very playful and classic fabrics! It’s not the usual stuff people would go for and I think that is great! Orange will will amazing with it…as well as white! That chartreuse will look great with orange! I love Joel Dewberry fabrics (and Michael Miller fabrics and Amy Butler fabrics…). There is so much to choose from. And anything with a tree motif just looks sweet to me. Just ordered (nearly) the entire Blue (and some orange) colorway of Modern Meadow in fat quarter with a big throw quilt at the bottom of my all white bed in mind. It’s arrived, I’ve petted it and it’s waiting for housework to get completed so it can come out and play. Oh, the nursery is going to be so lovely- I love the trees and birds- reminds me of a dream, which is a sweet image for a nursery:) Excited to see the final reveal! I’m using that gorgeous tree print for a mod quilt — nice pick! I really like these! Especially the herringbone one! It seems there are always less “boy stuff” but these are great, I can’t wait to see the final nursery! They’re going to be wonderful! Those trees have the perfect “storybook” vibe I love! How about using the herringbone for a roller shade fabric, too? What do you think? I adore that Herringbone (trees too) but especially the Herringbone. I’ve been looking for a green accent fabric for my boy’s room too, this may be the one! Your boy’s room will be perfection with pops of orange, yay! I am currently obsessed with Joel Dewberry and have just upholstered a bench in his Picnic Plaid. LOVE those fabrics you selected for a nursery. Have you seen the Etsy seller who does all custom nursery bedding using Joel Dewberry fabrics exclusively? GORGEOUS (and I am in no way affiliated)! I love Joel Dewberry fabrics! I ordered the Woodgrain fabric in yellow for my son’s custom bedding. It should arrive soon. Nice choices! Chartreuse is without a doubt my favorite shade of green. Especially loving it on the fabric with the trees! I love the fabrics. And they are not designer prices ($50+). Looking forward to seeing the room. I love joel dewberry’s prints, I ordered several for a baby quilt I made for my cousin, they were gorgeous in person! I love Joel Dewberry’s new line. Have you seen his new book yet – Sewn Spaces…. He has some really awesome projects that he’s put together with his fabrics! I didn’t realize he had a book out. Thanks for mentioning it. Sooo nice! I have an asparagus and chartreuse green thing going in my living room! Love it! aww, Nicole, I love it! I think we are style twins :) those fabrics are so perfect. love it. will be amazing with the orange! Ohhh how pretty it’s going to be! You need this matching print!! ohhh, suuuper cute fabrics. i love the herringbone! I love the herringbone pattern! Stunning! Oh you’re the best mom ever! I did that same green with orange (and pink) in my little girl’s room. I just love it. Here are some pics if you are interested. It really did turn out fun! I love the fabrics you chose! I just did our baby boy’s nursery in the same collection. The crib sheet and skirt are the same as the fabric you picked. It looks great, you’ll love it! I’ll be posting final pics next week hopefully! just wondering Nicole, how many yards are you ordering? i was thinking ordering about 3 for window size 50×80..do you think that should be good enough? I ordered six yards for the curtains — three for each panel. I love that tree print. I’ve been trying to think of an excuse to buy it. I really like these choices for a baby boy. I have this shade with some chocolate browns in my son’s room. Not sure what our next one is going to be yet, but will bookmark this line of fabrics. The modern grass is such a nod to Frank Lloyd Wright, whether you intended for it or not! As a fellow Oak Parker, I will have to keep it in mind for the future.